Vincent began his career in 2000 at Société Générale where he held various positions in the Mergers & Acquisitions division in the United States, Italy and France. In 2005, he joined the Mergers & Acquisitions department at the Carrefour Group to further become Group Strategy and M&A Director. In February 2015, he became Secretary-General of Carrefour France, before being appointed Merchandise & Supply Chain Director in 2016. In October 2017, he joined Groupe Blachère as General Manager. The company operates in the bakery, ready to eat and fruit and vegetable retail businesses with 7,000 employees. Vincent holds a degree from the EDHEC Business School. Mathieu Chabran founded Tikehau Capital Advisors in 2005 after beginning his career at Merrill Lynch and Deutsche Bank. This pan-European asset management and investment group, listed on Euronext Paris, manages more than 10 billion in assets, with 1.5 billion in equity. It invests in various asset categories, including private debt, property, capital investment and liquid strategies. Tikehau Capital is controlled by its management team, together with leading institutional partners, and employs 170 people in offices in Paris, Milan, Brussels, London and Singapore. Mathieu Chabran holds degrees from the ESCP Business School and Science Po in Aix-en-Provence. CHAN King Wa has been working for The Hong Kong Federation of Youth Groups since he graduated from university in 2008. He worked as a development officer and his main duty was to establish a new centre, providing continuous training courses to the general public. CHAN King Wa actively sought cooperation with outside partners and qualified trainers and helped the centre maintain steady growth from its setup in 2008. After that, CHAN King Wa was promoted to Unit-in-Charge in 2014, to provide global oversight of service at the centre. Besides training courses offered in Hong Kong, CHAN King Wa is also experienced in organised mass-participation events; he helped the federation achieved a Guinness World Record for the “Largest Display of Sculptures made from recycled materials”, for which over 10,000 pieces of artwork were submitted by young people from Hong Kong. CHAN King Wa obtained his Master’s degree from the Hong Kong Polytechnic University, majoring in management (Human Resources Management). Before that, he received his Bachelor’s degree from the City University of Hong Kong, majoring in Public Administration and Management. CHEN Gang started his career in 2002 as Senior Manager for Roland Berger Consultants China, where he worked for three years. He then held the position of Senior Manager, Assistant to VP for the Volkswagen Group China between 2005 and 2008. Gang is currently the Executive Vice President of Changjiu Logistics, where he is not only the Head of Changjiu International Business, General Manager of Changjiu Germany GmbH but also General Manager of CDC International Logistics Co. Ltd (Subsidiary of Changjiu). His company is a proactive advocator of “Belt and Road”, and a major international railway operator in Europe (contracts with Volkswagen, Audi, Land Rover, Volvo, and others). Gang was awarded “Outstanding Entrepreneur of China Logistics Industry” in 2014 and 2016 and Chief Expertise of China Automotive Logistics by CFLP. Besides these activities, he is a speaker and professor at the Management School of Xi’an Jiaotong University. Chen Gang graduated and obtained a Ph.D. majoring in Logistics Management from Xi’an Jiaotong University. Guillaume DEBRE worked as a journalist for the American news channel CNN for five years. He was sent to Iraq and Haiti and covered the 2004 presidential election. He was a correspondent for TF1 and LCI in Washington D.C. from 2005 to 2014 and went on to become a senior reporter. He is known for covering the conflict in Syria and now serves as Deputy Managing Editor at TF1. He is also the author of several books on American politics, including Obama, Les secrets d’une victoire [Obama, The Secrets of Victory], a behind-the-scenes look at the 2008 presidential campaign. Guillaume DEBRE holds a degree in law, is a graduate of Sciences Po and received a master’s degree in International Relations from Columbia University in New York. After initial work experience in New York, Pauline Duval joined the family group in 2012. This group works in promotion, project management assistance, delegated project management, asset management, third-party asset management and investment. It operates in the tourism and sports sectors, and in residences with services for seniors. Pauline Duval is particularly involved in international development and the diversification and digitalisation of its activities. In 2013, she created a Fintech division and launched an initiative to acquire stakes in young, innovative companies. She is currently CEO of the group. After studying management at Pantheon-Assas University, Pauline Duval continued her studies at the Metropolitan College of New York where she received her degree. Before transferring to her current position as Vice President of North China University of Water Resources and Electric Power (NCWU) in 2015, Jingyan Gao had worked with various governmental organizations in China, including three years as Assistant Director of Zhengdong New District Administrative Committee, three years as President of the Youth League Zhengzhou Committee of Henan Province, and four years as Deputy Mayor and Head of the Publicity and Communication Department of Siping City in Jilin Province. With 30,000 students and 1700 faculty and staff members, NCWU is a publicly funded university organized into 18 schools and research centres. Its mission is to advance knowledge and educate students in science, technology, and other areas of learning that will best serve the nation. Jingyan’s main academic strengths are political economy and international relations. She also sits on the board of the Henan Women’s Research Society. Jingyan Gao was born and brought up in Beijing. After graduating in 1998 from the Foreign Affairs College of China with a BA, she went to the US for graduate studies. She attended the University of Iowa and Boston University and got her MA and Ph.D. respectively in 1999 and 2004. Upon graduation in 2000, Eric Ho returned to China and started his career in Macau and Hong Kong. In 2004, he commenced his public services work, focusing on youth, economics, sports and cultural spectrum. He is currently a committee member of the Chinese People’s Political Consultative Conference of Beijing, a member of the Beijing Youth Federation, a member of the Macao SAR Government Community Service Consultative Committee, Chairman of the Supervisory Board of the Macau International Airport, President of the Macau Money Exchangers Association, Vice Chairman of the Global Tourism Economy Research Centre, Vice Chairman of the Youth Elites Association of Macau and Vice President of the Swimming Association of Macau, among other positions. Eric Ho has extensive experience in investment banking origination, capital markets and legal practice. He was an analyst at JP Morgan in 2000 and then a solicitor at Linklaters between 2003 and 2006. Between 2007 and 2010, he worked at Deutsche Bank AG, Hong Kong Branch and was Vice President of Hong Kong Banking and their Head of Hong Kong and Macau Origination. In 2009, Eric Ho founded Ample Hope Limited in Macau and is currently Chairman of Ample Hope Entertainment Company, Ample Hope Education Company Limited and P&W Money Changer Limited. He is also the Co-chairman and Executive Director of O Luxe Holdings Limited (HKSE Stock Code: 860) and the Independent Non-executive Director of Nature Flooring Holding Company Limited (HKSE Stock Code: 2083). Eric Ho was awarded the Chinese Economics Elite Award and the Australia National Student Prize. Eric Ho graduated from the University of New South Wales, Australia with a Bachelor of Commerce (Finance) and Bachelor of Law. He is a practicing solicitor in the Hong Kong Special Administrative Region. Since May 2017, Aurélien LECHEVALLIER is deputy Diplomatic advisor to the French President. He began his career in 2004 as Deputy Head of the International Cooperation and Development office, at the French Ministry of Foreign Affairs. In 2007, he moved to Washington as Transatlantic Diplomatic Fellow for the Department State. One year later, he was appointed Political counselor at the French Embassy in the United States, prior to moving to Lebanon, in order to head the cultural services of the French Embassy. In 2013, Aurélien LECHEVALLIER returned to France to become the diplomatic advisor to the Special Envoy to the President of the Republic for the Protection of the Planet, prior to joining the Mayor of Paris as Diplomatic advisor. In 2017, he became Senior advisor at the Center for Analysis, Forecasting and Strategy at the French MFA. Aurélien LECHEVALLIER graduated from HEC in 2000, Sciences-Po Paris in 2001 and ENA in 2004. Shanxi Bio-diagnosis and Immunotherapy Engineering Research Center. Before graduating, she founded Jiangsu Antae Biological Technology Co., Ltd in 2007 and was appointed Chief Executive Officer. At the same time, she served as Director at Hepatopathy R&D Centre of China Medical City in Taizhou City, where she has worked for eight years until now. LUO Jin founded Antae Healthcare Investment Management, Inc. in 2014 in America. With 200 employees in China, the business scope of Jiangsu Antae Biological Technology Co., Ltd focuses on development and consulting of biotechnology, medical apparatus and instruments. The company is an international leader in the field of single epitope antigen peptide and cell research and has undertaken eight national and provincial scientific research projects. It published the paper “Autologus dendritic cell vaccine for chronic hepatitis B carriers: a pilot, open label, clinical trial in human volunteers” in Vaccine in 2010. This included 380 clinical trials which is the highest number in the world. Aside from her professional endeavors, LUO Jin was elected as a member of the National People’s Congress in 2013. LUO Jin has won some notable awards : the “Science and Technology Progress Awards” in 2005, selected for “Entrepreneurship and innovation talent, Jiangsu Province” in 2008, “333 talent, Jiangsu Province” in 2009, “113 innovative talent, Taizhou City” in 2013, and “Six talent peaks, Jiangsu Province” in 2016. She was also rated among the young and middle-aged experts with outstanding contributions by Taizhou City in 2016. She is a member of several professional bodies and societies, acts as Expert to the Committee of China Reproductive Health Industry Association, Vice Chairman of China Reproductive Health Products of Standardization Administration of Regenerative Medicine, Committee of China Microarray Standard Committee, Professional Committee of Shanxi Clinical Genetic Diagnostic Quality Control Center. LUO Jin studied at the Fourth Military Medical University. She obtained a Ph.D. in 2008. From April 2013 to July 2014 she was a research fellow at the University of Michigan and then was a visiting scholar at Stanford University from July 2014 to July 2015. Alexandre Mérieux launched his career at the Silliker Group Corporation in the United States before returning to Europe as Head of Marketing and Operational Centre Management in France. In 2005, he joined bioMérieux where he served as Director of the Industrial Diagnostic Unit. Between 2011 and 2014, he directed the Microbiology and Industrial Operations Unit before taking over as CEO of bioMérieux in April 2014. He is also the Chairman of Mérieux Développement, CEO of the Institut Mérieux and Chairman of the Mérieux NutriSciences Board of Directors. Alexandre Mérieux holds a degree in biology from the University of Lyon and graduated from HEC Montréal. Julie Narbey has been General Manager of the Pompidou Centre since May 2017. She began her career at the General Secretariat of the Ministry of Culture of France in financial and supervisory posts at public institutions before joining the Quai Branly Museum in 2008 as Director of Administration and Human Resources. In 2010, she was appointed financial advisor to the cabinet of Frédéric Mitterrand, Minister of Culture. In 2011, she joined the Palais de Tokyo as Deputy Managing Director, where she actively contributes to the development of an innovative cultural model. Julie Narbey is a graduate of Sciences Po Paris and the ENA. In 2014, Othman NASROU was elected to Trappes city council and as Councillor to the urban community of Saint-Quentin-en-Yvelines. The same year, he became the Chairman of the Board of Directors of Promopole Semi, a business incubator created in 1987. In December 2015, he joined the Regional Board of Ile-de-France as Chairman of the Commission on Economic Development, Employment and Innovation, where he supervises the economic policy. In July 2016, he was elected Vice-President in charge of international action and tourism for Ile-de-France. In May 2017, he was unanimously elected Chairman of the group now called “Les Républicains et Indépendants”. Othman Nasrou holds a degree from HEC. Agnès PANNIER-RUNACHER began her career at the Ministry of Finance as Finance Inspector in 2000. After three years at the Assistance Publique-Hôpitaux de Paris as Chief of Staff in charge of economic and financial management, she was appointed Deputy Director of Finance and Strategy and Head of the M&A and Strategic assets department at Caisse des Dépôts. In early 2009, she helped set up the Fonds Stratégique d’Investissement (FSI) and joined its Executive Committee where she oversaw an investment portfolio alongside the financial management and portfolio strategy. In 2011, Agnès PANNIER-RUNACHER joined FAURECIA Interior Systems as Director of a Customer business unit. There, she managed product development for new vehicles and commercial relations with OEM’s. In 2013, she was appointed Deputy CEO of CDA, the world leader in ski areas management with 11 ski resorts and 4th operator of Leisure parks in Europe. Agnès PANNIER-RUNACHER is a graduate of the ENA and HEC. She is a Board member of Elis, APRR, Bourbon and the Grameen Crédit agricole Foundation. She was also involved on the field with En Marche! and part of the recruitment commission that has chosen the candidates for general election. After a career in the hotel industry and working as a sommelier in Dijon, Manuel PEYRONDET joined prestigious establishments such as Georges V, Taillevent and Royal Monceau where he worked alongside the leading names in French sommellerie and helped improve the wine cellars and their offerings with his personal touch. Manuel PEYRONDET took an entrepreneurial leap and created Chais d’Œuvre, which now has more than 700 members who each sample a selection of fine wines selected by Mr Peyrondet every month. Manuel PEYRONDET was named Best Young Sommelier in France at 25 (2005), then Best Sommelier in France at 28 (2008). Brune POIRSON began her career in England where she worked for the National Endowment for Science, Technology and the Arts (NESTA). She went on to work on innovation and development in India and then in the United States. She has worked in the public (AFD), private (Veolia) and non-governmental (NESTA) sectors. On 18 June 2017, she was elected Deputy of the third electoral division of Vaucluse, and on 21 June 2017, she was appointed Secretary of State to the Minister for the Ecological and Inclusive Transition. A native of Vaucluse, Brune POIRSON studied at Sciences Po Aix and graduated from LSE and the Harvard Kennedy School of Government. Stéphane RINDERKNECH started at L’Oréal in the United States in 2001 within Travel Retail as Head of the Latin America division. He was soon appointed Director of the Biotherm and Helena Rubinstein brands for Latin America. After a quick stint in Europe, he transferred to Japan as CEO of Biotherm. In 2007, he was promoted to Deputy CEO of Lancôme where he helped accelerate the brand’s development. He then took over the L’Oréal Luxe division in South Korea where his vision and operational flair led to division growth at twice the speed of the market. 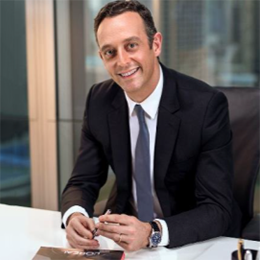 After six years in Asia, in July 2011, Stéphane RINDERKNECH was appointed Vice-Chairman of the Chinese division of L’Oréal Luxe. In 2015, Stéphane RINDERKNECH was nominated as General Manager of the Consumer Product Division, still in China, before becoming L’Oréal China country CEO in March 2016, position he occupies to now. Stéphane RINDERKNECH is a graduate of ISG. WANG Dake started his career at the Ministry of Foreign Affairs in 2002. From 2005 to 2009, he was Third Secretary in the Department of European Affairs. From 2009 to 2014, he was Second Secretary at the Chinese Embassy in Berlin. He returned to the Ministry in 2015 and worked as the Deputy Division Director in the Department of European Affairs until 2016 with responsibility for relations with Nordic Countries. Since February 2016, he has been the Deputy Director of Division for relations with German-speaking countries. WANG Dake graduated from Beijing Foreign Studies University for German Studies in 2002 and then studied International Relations at Freie Universität Berlin from 2004 to 2005. Wang Hongwei has extensive work experience including: five years in the Life Sciences Division of Lawrence Berkeley National Laboratory in Berkeley as a Postdoctoral Fellow, two years as a Research Scientist, three years in the Department of Molecular Biophysics and Biochemistry of Yale University in New Haven as a Tenure-Track Assistant Professor, seven years in the School of Life Sciences of Tsinghua University in Beijing as a Full-Time Tenured Professor, and one year as a Dean. With 117 full-time faculty and staff members, including 71 tenure-track faculty, 9 teaching staff, 11 research staff, 23 technical staff, 3 administrative staff, as well as 95 post-doctoral fellows (including 5 members of the Chinese Academy of Sciences, 6 One-Thousand-Talents Scheme Scholars, 15 Cheung Kong Scholars, 24 Outstanding Young Talent of the National Science Foundation for China, 5 National “973” Project PIs and 23 Youth One-Thousand-Talents Scheme Scholars), the School of Life Sciences is positioned as one of most distinctive and influential institutions for higher education and research in biology nationwide. Aside from his professional endeavours, Hongwei is a Council Member of the Chinese Physical Society, Chinese Biophysics Society, Chinese Electron Microscopy Society, the Executive Editor of Biochemistry, and sits on the editorial board of the Journal of Biological Chemistry and Biophysics Report. Before graduating in 2001 from Tsinghua University with a Ph.D., Wang Hongwei attended Tsinghua University, where in 1996 he obtained a Bachelor of Science. Experienced Regional Chief Actuary of AXA life business in Asia, with breadth and depth in fostering strategic development, risk management and thought leadership in insurance, WONG Ka Man is a strong believer of letting “a different voice being heard”, supporter of women’s leadership, east-west cultural bridge and generational inclusion. She is on the Regional Financial Leadership Team and a member of the AXA Global Senior Executive Development Program. AXA is an international insurer operating in 64 countries with 166,000 employees, serving over 103 million customers on both life and general insurance fields. WONG Ka Man is energetic and passionate for the continuous bettering of the profession, being frequent public speaker and liaison representatives in international, regional and local industry bodies. Her latest role was the President of Actuarial Society of Hong Kong (2016) and sponsor of the Young Actuaries Program, as well as and member of Federation of Insurers Club2028 and insurance regulator “future of insurance” taskforce. WONG Ka Man is currently one of the ambassadors to the new 2017/2018 Public Positive Image Campaign Program launched by the Hong Kong government for the insurance sector. Included in her work experience are: 5 years in AXA taking leading positions in risk management, finance business partner and actuarial, 6 years of strategic & financial services consulting as Principal Consultant at Towers Watson, and 2 years as the Chief Risk officer in Sunlife. WONG Ka Man graduated with First Class Honours Distinction in Bachelor of Actuarial Science in the University of Hong Kong in 2001, subsequently qualified as a Fellow of the Society of Actuaries, U.S. in 2004. Xu Kai is currently the Vice-chair of University Council and Vice President of Shanghai University of Electric Power (SUEP). He graduated from East China Normal University with a PhD in British and American literature in 2016. He is a Professor of English and the author and translator of several books and many articles on literature. His work experience includes: 4 years as the Head of HR Office, Shanghai University of International Business and Economics (SUIBE); 3 years as the Dean of School of Foreign Languages (SUIBE); visiting associate professor at the University at Albany, State University of New York (SUNY); visiting scholar at University of Queensland and La Trobe University, Australia. He worked at the Charoen Pokphand Group, Thailand in 2015 as intern Vice President. His research projects won national grants like China National Social Science Research Funding, and China Ministry of Education Social Science Research Funding. He has won many awards for excellence in teaching and academic research, such as the “Baosteel Excellent Teacher Award”, “Australia–China Council 2012 Special Book Prize for Translation”, and “Teaching Achievement Award of Shanghai Municipal Government”.